Choiysa ternata are a very hardy drought tolerant bushy shrub, attractive glossy green foliage with heavily scented flowers from spring through summer. 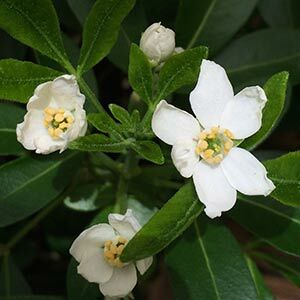 Also known as Mexican orange blossom (Choisya ternata) choisya are a fragrant flowering plant requiring little attention other than shaping, these characteristics make it a great plant for landscape uses in a border or as a specimen plant. Choisya can be grown in pots,they prefer full sun but will do well in semi shade. Available in a range of sizes from wholesale growers. An excellent landscaping choice for cooler climates working better than Murraya in these areas. Best spaced at around 40cm apart for a good dense hedge. Prune after flowering to maintain shape. Fertilize with a slow release type in spring. Country of origin – Mexico to southern North America. Soil – Humus rich moist well drained, can withstand dry periods.